I'm not sure this is correct venue for this, but I couldn't find a place on this site that quite fit... I am turning 70 this coming Friday, March 2, and would appreciate if just for fun, those who are willing would draw one card for me for a one-card reading for my birthday. It would be interesting to see what came up. I promise not to ask again till 2022 (80) - well maybe 2017 (75). I would be happy to let anyone on the list see the replies. Admin note: I moved this thread to the appropriate newly created forum. Please post your replies here. Thank you. On Friday I will indeed draw a card for our "Precious Member Grey Mere"
I pulled a birthday card for you - 4 of Cups from the Robin Wood. I see the figure by the tree as you looking a little disgruntled over the computer problems you have had (I can identify with that), but the radiant Cup in the air being proffered suggests an end to the annoyance and a bright shining year ahead. Subject:Re: Its Scamphill "s Birthday Today ! The card I drew, accompanied by my black cat, Isis (who always likes to "help"), is The Empress from The Legacy of the Divine. This card seems so Spring like, which is nice to see as we approach the end of the long winter. The Empress is surrounded by animals from the land and the sea. Everything is lush and fertile. I'm drawn to the blowing of the dandelion seeds and the flight of the butterflies. Scamphill, all the seeds you plant will come back to you. All the dreams and wishes you send out into the world will transform you and give you the promise of a bright future. I also notice the rat climbing the arch in the midst of the blowing seeds. Even the most lowly of us can reach new heights with the support of someone who cares. Scamphill, you are willing to nurture all creatures, big and small, and the world is a better place because of it. I was inspired to pull a card for your birthday too!! I got the 10 of Pentacles from the Druidcraft Tarot. The older man looks a little weary in the card. It could be you with the computer problems. However, there are lots of people around and a loving dog and that tells me that you have lots of help and people who love you and will be there for you. All of us for instance, and your family. I feel a lot of Karma and all the wonderful things that you have sent out will come back to you, but even more. Dear Crisdee, I look forward to your birthday post - thank you in advance! Dear CitharaRaven, Thank you for setting up this forum. I think it can only draw members of the list closer together if we draw birthday cards for each other. Dear Scamphill, we all appreciate all the work you do for us on this list. I just had an inspiration when I saw it was your birthday coming up. Seems like I have really started something that will be fun. As time goes by, I bet more and more members will take part in this Forum. 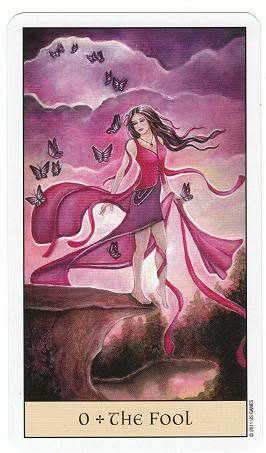 Happy Birthday Grey Mere, the card I drew for you is the 2 of cups Infinite Visions tarot. Today all your relationships look promising put on a pedestal to be admired for your youthfulness and elegance. Eye contact is especially important, I feel there’s someone around you that cannot find the words to express their feelings/thoughts, whether there tongue tied, just feel awkward, or think it goes without saying, their eyes will speak for them. The simplest of thing/gestures will bring pleasure to the heart… Have a Lovely Day Grey Mere. Thank you. I shall think of your 2 of Cups as my friends and loved ones gather for my party. Again Happy Happy Birthday "Grey Mere"
Thank you, Scamphill. As young as I feel? That's quite young! I'm perfectly willing to set off on a new adventure (actually I am planning to take up the study of I Ching, at least a little). I'm about to set off for the airport to pick up my out-of-state daughter who is flying in for my celebration. So I wpon't be online for a while. Happy Birthday Dear "Grey Mere"
Interestingly, it seems to be conected to the card Scamphill pulled for you. In this card, there's a housewife cleaning (a chore I personally don't like, hehe). But to me, she's already done her project and she's taking a look at her accomplishment (and clean floor). I also see her looking to see what else she needs to do--a new project, if you will. 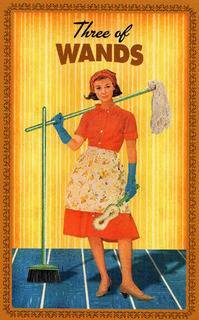 To me this card says that you're ready to tackle any chores, projects, stains, and/or dust bunnies that head your way. You'll put those poor dust bunnies in their place (or your Swiffer); you'll make progress--maybe it won't be quick, but it will be steady. Whatever it is you decide to take on, it will give you satisfaction. I think you'll meet whatever life throws at you head on this coming year, AND you'll enjoy it! P.S. Sorry the image is so big; I resized it in Photobucket, but I guess it insists on staying huge. Thank you for the 3 of Wands from the Housewives. That deck is a real hoot, isn't it? Hmm, well as High Priestess and co-leader of a Coven, I do have to occasionally "clean up messes"! However, new projects do abound, and I am looking forward to working on them. My body may a few twinges, but the old mind remains tarp as a shack! P.S. I see the little information tag on each post has me automatically updated to 70! Ain't modern technology wonderful? Thank you again to all who drew a card for my 70th.